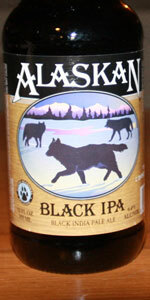 Alaskan Brewing Company is adding to their Winter and Summer seasonal line with the introduction of Alaskan Black IPA, a Spring seasonal. The beer pours a dark brown, porter-like, with a not quite tan head that leaves a decent lacing. Piney, resiny citrus hops aromas fill the nostrils with dark, coffee like scents poking through. Roasty malt flavors dominate the pallet at first, with lighter chocolate and citrus flavors balancing out the somewhat bitter finish. A somewhat lighter body is met with a medium amount of carbonation. A very well balanced version of a style that continues to get more and more entrants, and a great beer to sip on those "Spring" Alaskan nights.